In 1994 Presto introduced the PowerPop microwave popcorn popper. 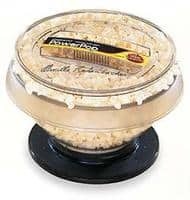 While microwave popcorn poppers had been on the market for years, they had a reputation for leaving hundreds of unpopped kernels. All this changed with the unique design of the Presto PowerPop. An exclusive combination of a reflector that was built into the unit's base and a special disposable popping cup enabled the PowerPop to concentrate microwave energy so effectively that virtually every kernel would pop. The PowerPop was also designed to pop with or without oil so consumers could have a choice of delicious buttery popcorn or a light, low fat snack. What Makes the Presto PowerPop Unique? The Presto PowerPop is comprised of four separate pieces. Three are shown in the picture on the left. There's a see-through popping and serving bowl. This bowl has two carrying handles that should be used when taking the hot bowl from the microwave. A see-through cover with a handle fits on top of the bowl when popping corn. The removable black plate is called the PowerBase concentrator. It connects to the bottom of the bowl with a series of locking tabs. 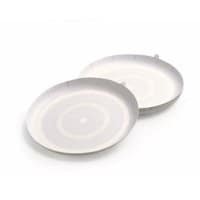 The PowerBase concentrator should be attached to the bowl when popping then removed so the bowl can be washed by hand in soapy water or put in the dishwasher. The PowerBase should not be immersed but simply wiped clean with a damp cloth if necessary. The fourth and final piece is called a PowerCup Concentrator and is shown in the picture on the right. The PowerCup concentrator is replaceable and fits tightly against the bottom of the inside of the popping bowl. The permanent PowerBase concentrator and the replaceable PowerCup concentrator work together to focus the microwave energy on the kernels at the bottom of the bowl. This unique design is why the Presto PowerPop does such a great job of popping virtually every kernel. The Presto PowerPop gives the user the option to use oil or not. If oil is used (2 Tbsp max) it is simply poured onto the PowerCup concentrator at the bottom of the bowl. The popcorn kernels are then placed on top of the oil. If desired, sprinkle with salt. The popper specifies 1/3 cup of kernels which will yield about 3 quarts of popcorn. If you want popcorn similar to air popped just put the kernels directly on the PowerCup concentrator. It is not recommended that salt be added prior to popping as it will not stick to the popcorn. The PowerCup concentrator is disposable, but it's designed for multiple uses. The number of uses will vary with microwave ovens and whether or not oil is used. The manufacturer estimates no more than 12 batches when oil is used and no more than twice that with no oil. See additional information on the PowerCup concentrator in the next section. Nearly all users swear by their Presto PowerPop. Once they have adjusted the cooking time to their microwave the popper makes great popcorn without leaving many old maids. It works equally well with and without oil. The greatest source of angst for folks who were dissatisfied, and even some who were satisfied, with the Presto PowerPop was attributed to the PowerCup concentrator. Most users found that the life of the PowerCup concentrator was much shorter than estimated by the manufacturer. Others objected to the ongoing cost of replacing the concentrators. The cost is actually relatively small. 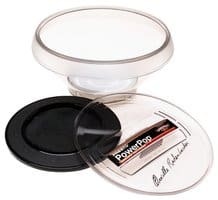 The PowerCup concentrators can be purchased numerous places including Amazon (8 for $4.00, free shipping) and Presto (8 for $1.58 + $3.00 shipping). So the average cost is about $0.50 a piece. If you get a life on the PowerCup concentrator that is half of the manufacture's estimate it costs you about $0.08 a batch with oil and $0.04 per batch without oil. This is significantly less expensive the using microwave popcorn in a bag and so much more healthy and better tasting. Obviously it would have been ideal if Presto could have achieved their goal of popping every kernel without the need for the PowerCup concentrator since dealing with it is a bit of a hassle. However, I personally believe that the minor inconvenience is worth it for great microwave popcorn. You need to decide for yourself.